is a six-monthly journal published by the COMITATO GLACIOLOGICO ITALIANO. Founded in 1978, it is the continuation of the “Bollettino del Comitato Glaciologico Italiano“. It publishes original papers, short communications, news and book reviews of Physical Geography, Glaciology, Geomorphology and Quaternary Geology. The journal furthermore publishes the annual reports on italian glaciers, the official transactions of the Comitato Glaciologico Italiano and the Newsletters of the International Association of Geomorphologist. 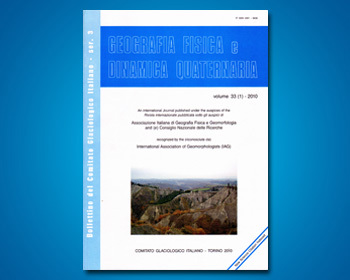 Special issues, named “Geografia Fisica e Dinamica Quaternaria – Supplementi“, collecting papers on specific themes, proceedings of meetings or symposia, regional studies, are also published, starting from 1988. Geografia Fisica e Dinamica Quaternaria is a peer reviewed scientific journal which adheres to the code of conduct for publications produced by COPE: Best Practice Guidelines for Journal Editors. It is mandatory that all parties involved – authors, editors and reviewers – are aware of and agree to the following ethical requisites. The language of the journal is English, but papers can be written in other main scientific languages. The Journal is Indexed/Abstracted in: Bibliography & Index of Geology (Georef); Geoarchive (Geosystem); Geobase (Elsevier);Geographycal Abstract: Physical Geography (Elsevier); Georef; Geotitles (Geosystem); Hydrotitle and Hydrology Infobase (Geosystem); Referativnyi Zhurnal. Geografia Fisica e Dinamica Quaternaria has been included in the Thompson ISI database beginning with Volume 30 (1) 2007 and now appears in the Web of Science, including the Science Citation Index Expanded (SCIE), as well as the ISI Alerting Services. Si autorizzano gli autori degli articoli pubblicati sulla rivista GEOGRAFIA FISICA E DINAMICA QUATERNARIA ad utilizzare riproduzioni in formato PDF dei propri contributi ai fini della valutazione della qualità della ricerca Scientifica (VQR) e dell’abilitazione scientifica nazionale (ASN).